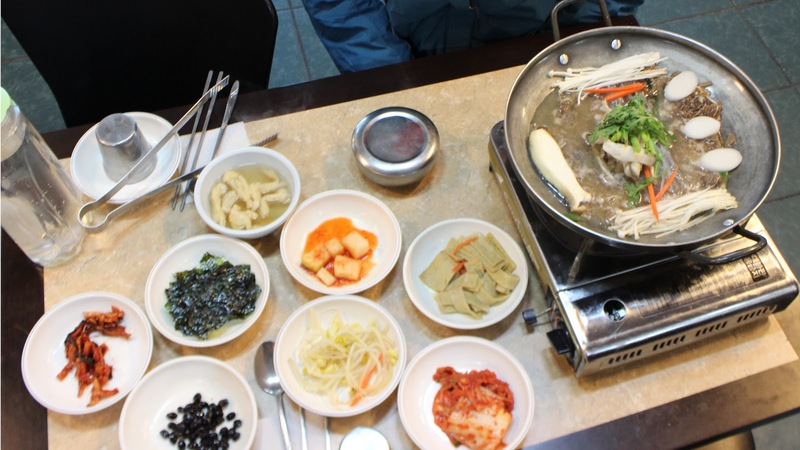 As yesterday, today is not a "Trip to Japan" at all as we're visiting Korea! It's our second and last full day in Korea today and we plan to visit the demilitarized zone (DMZ) that has separated North and South Korea ever since a ceasefire was signed in 1953. 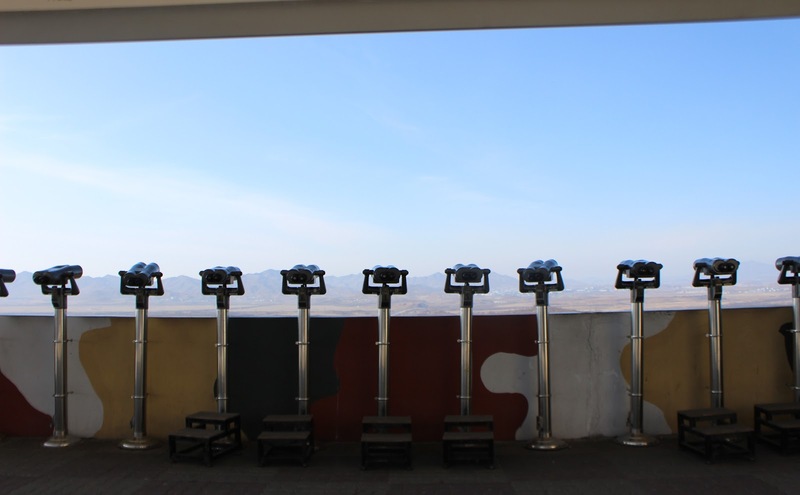 The DMZ is the most heavily fortified area on the planet with over two million heavily armed soldiers from both sides, as well as tanks, nuclear weapons, artillery, land mines and so on. So obviously you can't just rock up, but it is possible to book a tour, which is what we did. 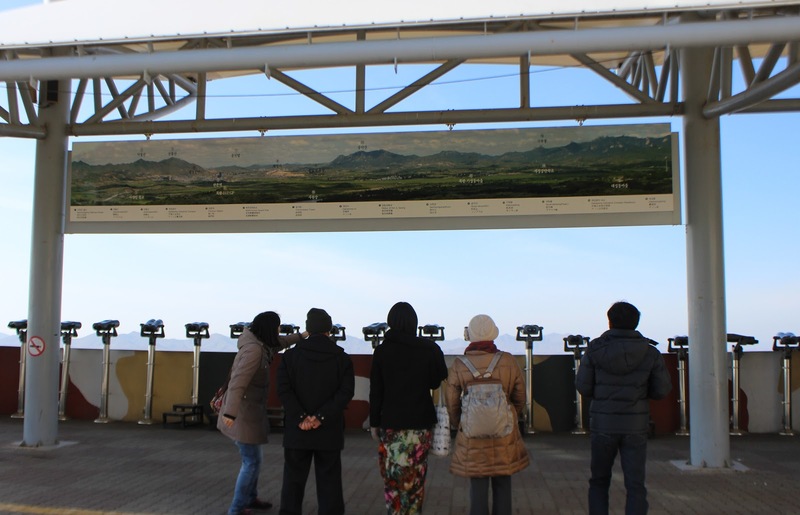 We booked with KTB which is the Korean Travel Bureau and signed up for their combined tour which visits Freedom Bridge in Imjingak Park, the Joint Security Area (JSA) and the Third Tunnel of Aggression. So, we first went to KTB reception at the Lotte Hotel, and waited inside with a bunch of other people. We had an English speaking tour guide and we'd joining with the Chinese and Japanese tour groups. We then hopped on the bus, heading north. Not long after leaving the city we started seeing signs of military equipment and our guide explained about the fence along the side of the river we were driving along. Although at this point both sides of the river belonged to the South, a fence was built as North Korean spies or soldiers would occasionally swim down the river. As we went further north we could see mountains on the other side of the river that were completely devoid of trees. Our guide noted that this was North Korean land and the trees had been removed to stop anyone sneaking across from the south. 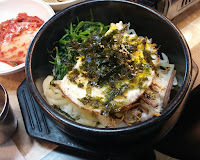 We were driving down a 12-lane highway, which rapidly emptied of traffic as we got closer. The reason it was so wide was to quickly transport tanks north if there was any trouble. Every so often we'd pass under bridges wired with explosives set up to drop down huge concrete blocks in order to block passage if required. 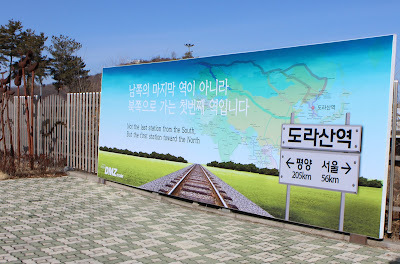 After an unnervingly short journey we arrived at Tongil Bridge which is the only connection between the DMZ and South Korea. At this point an armed US military soldier boarded the bus and checked everyone's passports. He stayed with us until we left the military area. 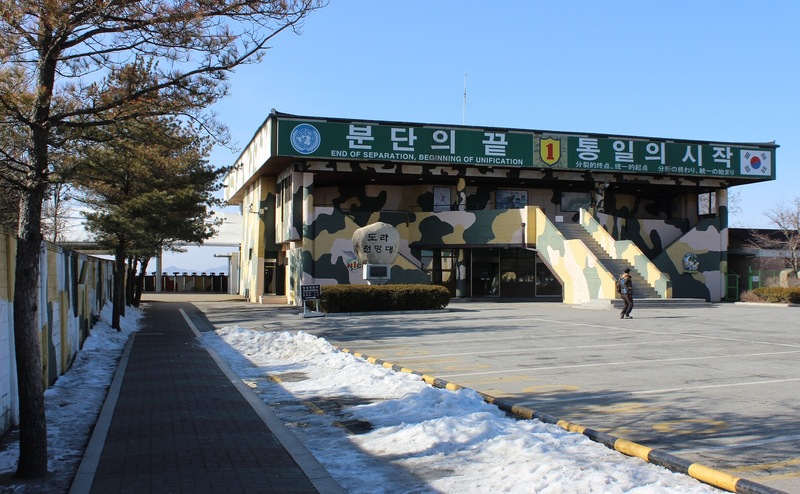 A short while later we arrived at Camp Bonifas which is located just 400m to the south of the DMZ and is a United Nations military command post located within the JSA. It was named after an American soldier who was killed in the Axe Murder or Poplar Tree Incident. 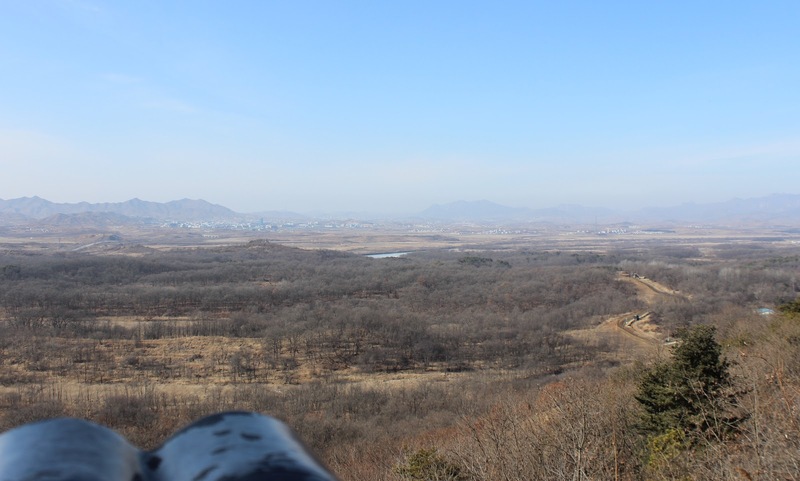 Basically what happened was that a large Poplar tree was blocking the view between a checkpoint and observation point on the South Korean side. 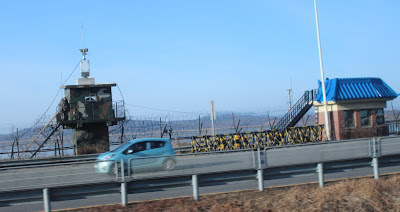 The checkpoint was next to the Bridge Of No Return which connected the two Koreas and North Korean soldiers had occasionally tried to kidnap people at the checkpoint. To keep an eye on things, it was decided in 1967 that the Poplar tree be trimmed. 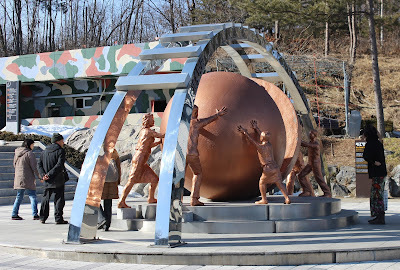 While US army personal were trimming the tree they were attacked and killed by North Korean soldiers who claimed that "Kim Il Sung personally planted it and nourished it and it's growing under his supervision". 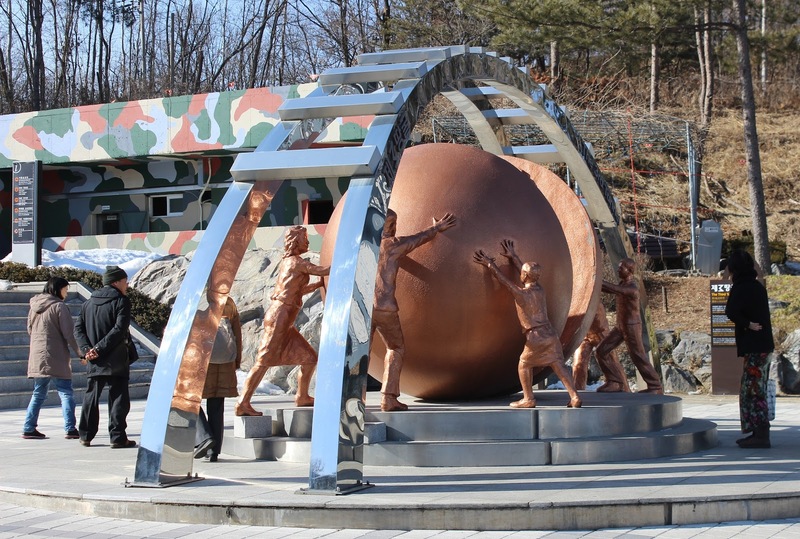 The USA and South Korea responded with a humongous show of force to cut down the tree which forced the north Koreans to back down and accept responsibility for the earlier incident. It's crazy to think that this could have sparked world war three. Upon arriving we went into a large building and watched a presentation detailing a brief the history of the Korean War and what had transpired to result in the current situation. After that it was time to visit the actual border area where there are a few buildings stretching a across the demarcation line (a small concrete division) which are used for diplomatic purposes. 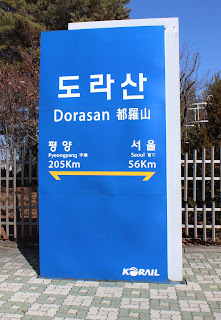 It was inside one of these buildings we could briefly cross into North Korean territory. Before coming to this area we had to sign a waiver and confirm that we understood all of the rules which included things like no sudden movement, dungarees, or patriotic displays. 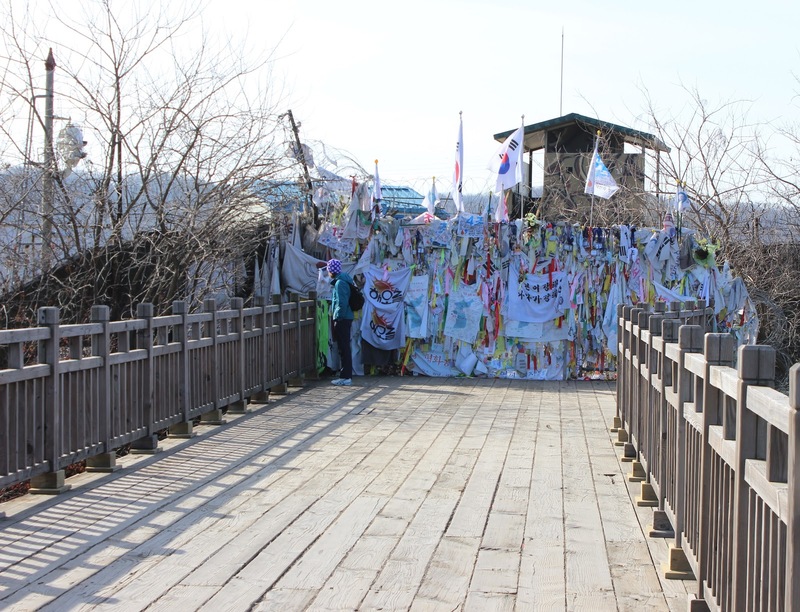 On the South Korean side there was a fair amount of personal, including soldiers who constantly stood guard at the end of the buildings. 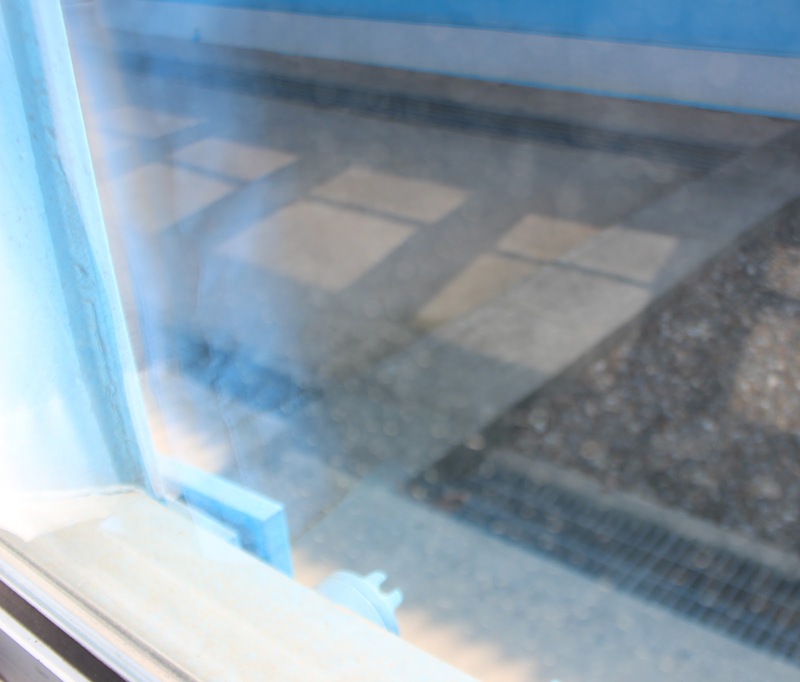 On the North Korean side there was just one soldier, though apparently there are lots inside the big building and the South Korean side can see them peeking out of the windows from time to time. 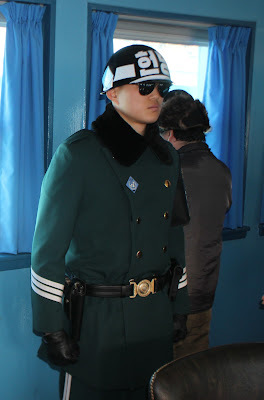 We only had a very limited time inside North Korea, enough time to have a quick walk around and pose with one of the South Korean guards inside. Apparently North Korea also used to have guards inside too, but they eventually stopped sending them. After coming back out we then stood and watched the other side for a while, and at one point the guard disappeared. We were told he was probably hiding behind one of the pillars while he delivered a report and sure he did reappear from a pillar after a few minutes. Next we went back to the bus which did a drive by of the Bridge of no Return, site of the aforementioned Poplar Tree Axe Murder Incident. 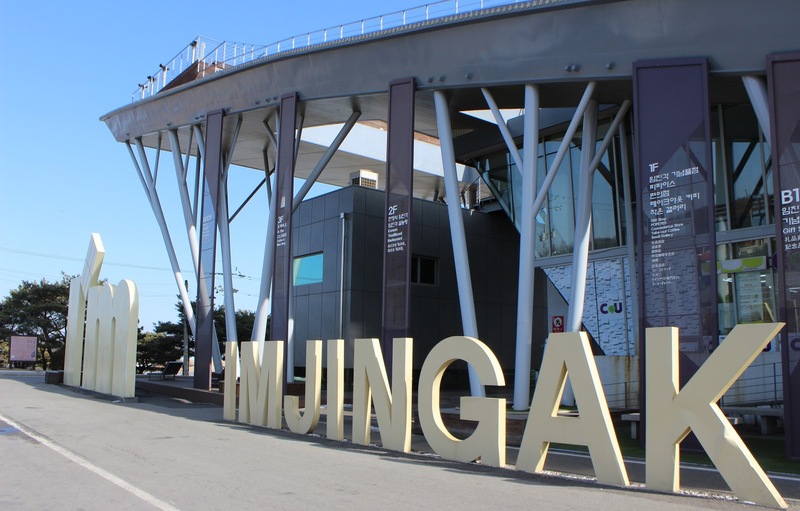 After that we left the Join Security Area and had Bulgogi at lunch at a small restaurant and then continued on to Imjingak Park which is a kind of theme park near the DMZ. 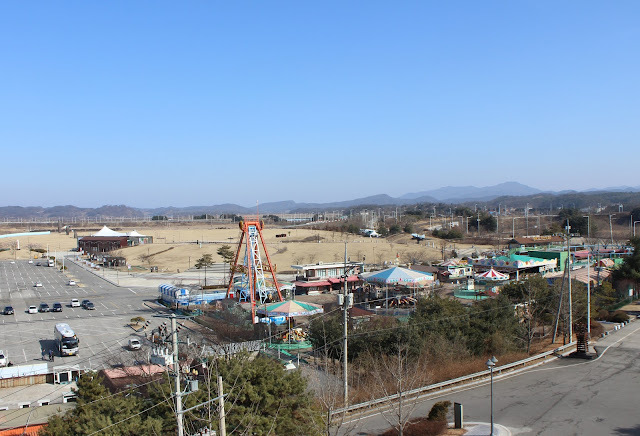 There's an observation platform and some rides and things, but it was pretty empty, maybe because of where it is, maybe because it was winter, I don't know. At this point all of the English speaking tourists apart from us left to go back to Seoul, and we continued on to the second part of the tour. 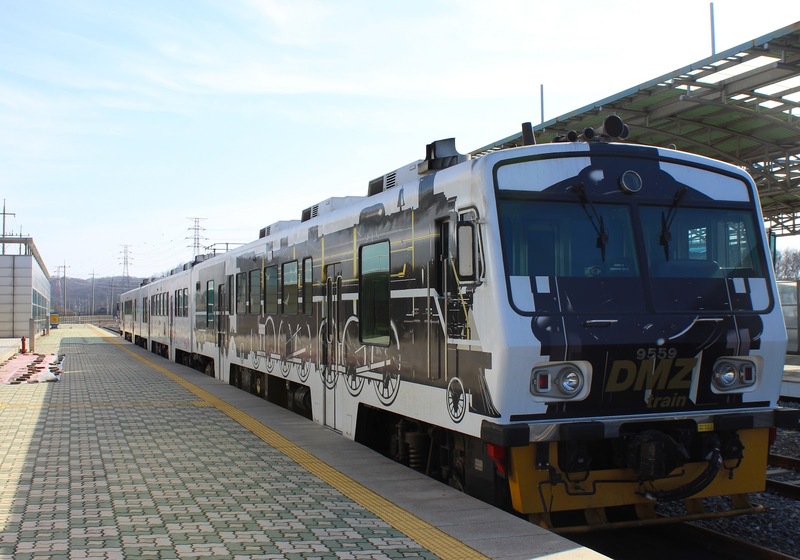 Next up was a quick trip over to Dorasan Station which is the furthest north train station in South Korea and is built with the hope of reunification, and was apparently briefly used for freight at one point. 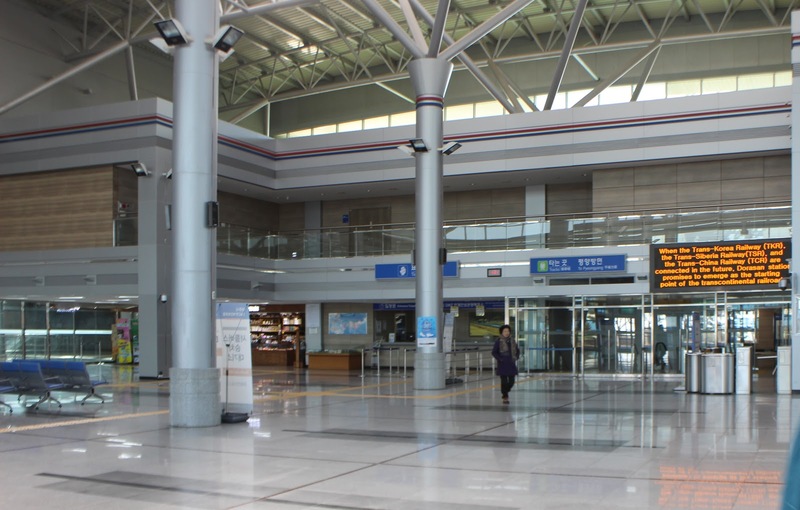 Inside was a bit like an airport but it was completely empty of actual people, there were quotes like "Not the last station from the South, but the first station toward the North". There was someone standing at the ticket counter though and I bought a ticket from them, which allowed me go out onto the platform where there was a train waiting and sign with the distances to Seoul and Pyeongyang. 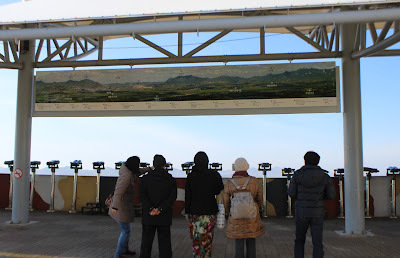 After that we hopped back onto the bus and drove up a land mine flanked road that wound up a hill to the Dora Observatory where we could look out into North Korea. In the distance we could see Kijong-dong village which is known as "Peace Village" in the North and "Propaganda Village" everywhere else. 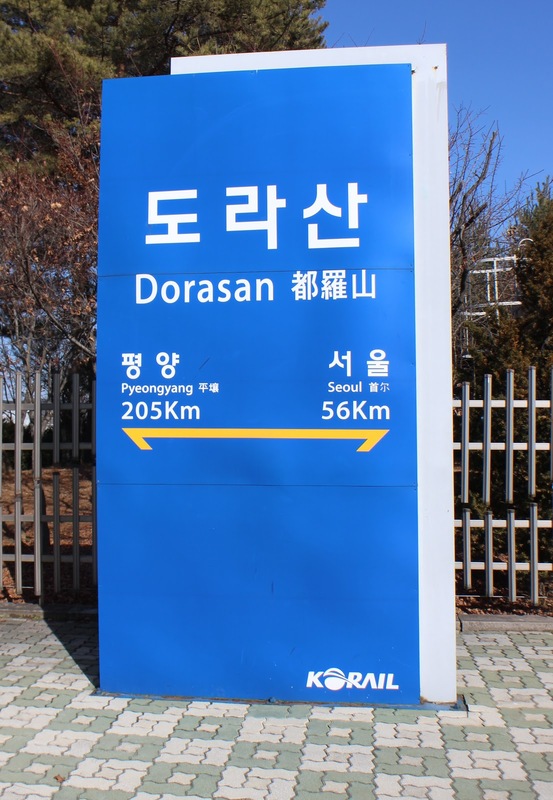 The village is actually located within the DMZ and according to the north it contains a 200-family collective farm, serviced by a childcare centre, kindergarten, primary and secondary schools, and a hospital. 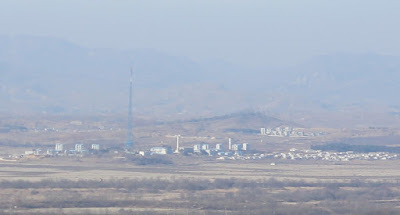 In reality, (thanks to modern zoom cameras/telescopes) it's known to actually be an uninhabited village filled with buildings that are just shells with no internal rooms or even window glass. Other peculiar features include lights going on and off at set times, and janitors keeping the streets clean. 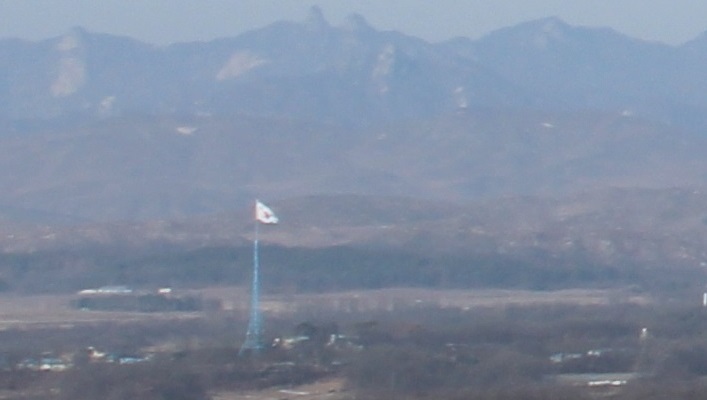 Oh and until 2004 there were loud speakers on top of the buildings broadcasting messages 20 hours a day urging the south Koreans to defect, though when that was found to be ineffective they switched to anti-western speeches and such. The south employed quite an interesting tactic with their speakers. The messages would start out innocently enough with weather reports and advice. For Example: "Expect rain tomorrow night, take in your washing". The ability of the south to predict the weather far exceeded the north and soon the soldiers began to reply on and trust the speakers. The speakers would then also relay news about the outside world, criticise the northern human rights abuses and play catchy K-Pop. The k-pop was enough of an ear worm that the northern soldiers would begin humming the south korean songs, infuriating the north who threatened to rain hell fire down onto the south and the rest of the world. They eventually, apparently, created their own north-k-pop group. Eventually both sides agreed to stop with the noise pollution. 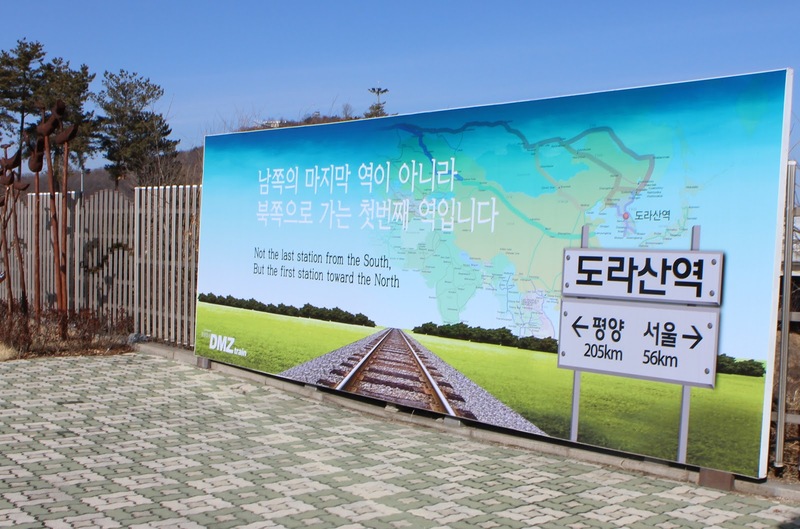 Though the south has started again in response to the recent nuclear testing by the north. Visually it's most notable feature is a massive 160m tall flagpole that was erected to spite the south after they build a tall flag pole. 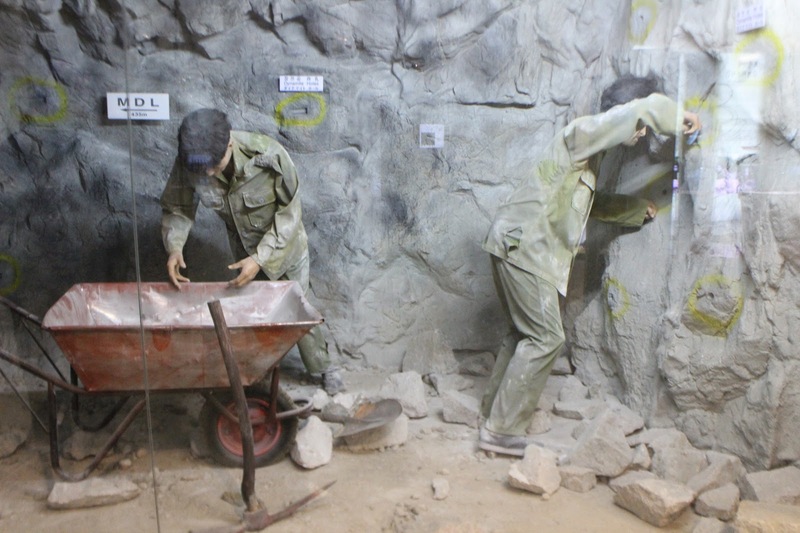 Our guide told us that it was really sad how much effort is put in to these things considering all the starving people (including some of her family) on the North's side. She also noted that although the North's pole is larger, their flag hardly ever actually flies as it's far too heavy, in contrast to the South's which doesn't require much breeze at all thanks to their superior textile technology. Our final stop was the Third Tunnel of Aggression which is one of many tunnels dug by the North Koreans in preparation for invasion. 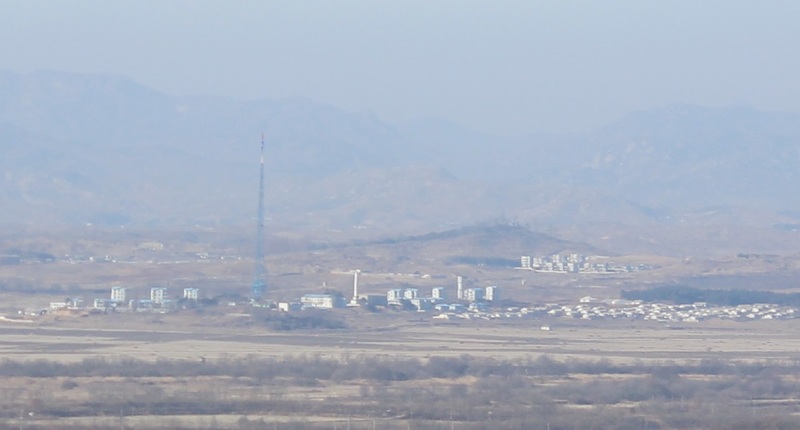 The existence of the tunnel was discovered thanks to information from a North Korean defector which prompted searches that have so revealed four tunnels, though it is believed there are currently many more yet to be discovered. This one is 73m deep, and wide enough to accommodate the passage of 30,000 soldiers per hour. Upon discovery, the North initially denied the existence of the tunnel, but then they claimed it was a coal mine. Once the south managed to gain access to the tunnel (by digging down on their side of the border) they found that it had been recently abandoned and the walls had been spray painted black to look like coal. Apart from the fact that it's pretty easy to tell actual coal from other rocks that have just been painted black, the walls of the tunnel are actually granite which is an igneous rock. Coal is a sedimentary rock and would be found with other sedimentary rocks, not inside what was once magma (generally you find layers of sedimentary rock and coal is one or more of these layers). We were able to actually walk down a long ramp into the tunnel which was very interesting, though for security reasons we couldn't bring any cameras down. The tunnel sloped down towards the North (so water could be drained out while they were tunnelling), and where the border would be there was a concrete barrier that the south had erected to block the tunnel off from the north. There are actually three of these barriers and there was a small window in the closest we could look through to see the next one. After having a look at the tunnel we climbed back out, which was quite a slog, and had a look at the museum at the top. While we were there a big bus of South Korean soldiers arrived to presumably have a tour as well. After that we hopped on the bus and headed back to Seoul! Tomorrow we'll be catching a flight back to Tokyo to recommence our Japan Trip! likin it, looking forward to the next one!